Dunder is the brainchild of two casino fanatics from Sweden. They both have years of experience playing at, and working in, online casinos. The combination of the two made the perfect recipe for them to start a casino on their own. Tired of shady websites and overal bad practices, they aimed to create something different. A straightforward online casino that supplies players with all of the fun but none of the hassle. Time to put their product to the test and see if their plan has succeeded! If you’re an avid online gambler you must have noticed that most casinos have a very similar lay-out. 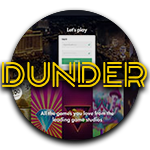 Contrary to its competitors, Dunder is an innovative casino that sports a groundbreaking lay-out. Scroll down the site and you’ll notice a bunch of informative areas in bold colours that are bright but not obnoxious. Signing up is the usual process, so we won’t spend too much time going in to that. The key difference between Dunder and other online casinos is the way they display their games. When opening the game lobby, you’ll immediately notice the unique section of categories. Thanks to the many years of personal gaming experience of the creators, they understand that every player is different. People don’t just have a preference for slots or table games, but also for slots with certain functionalities. As a response to individual preferences, Dunder Casino offers categories based on slot providers, themes and game features. Do you want to play videoslots that offer the possibility to win free spins? There’s a category for that. Interested in games from NetEnt? There’s a category for that. Fairy Tale lover? You’ve guessed it – there’s a category for that. This way of displaying games is incomparable with any other casino, and they definitely score high points here. The rest of Dunder is easily navigated and very user friendly. They offer a comprehensive help page with daily livechat and email support. No matter what type of (video) slot or table game you’re into, you will definitely enjoy yourself at Dunder. The Casino offers top-notch games from leading industry providers such as NetEnt, Thunderkick, Play ‘n Go, WMS, Quickspin, Microgaming, ELK, Evolution, and Betsoft. The Result? Over 600 games for you to choose from. If you’re a fan of Live Casino games, all you have to do is enter live casino in the search bar to quickly open the category. You’ll then be presented with 7 sub-categories. Six of these are live table categories offered by Evolution Gaming: Live Blackjack, Live Roulette, Deutsches Roulette, Live Baccarat, Live Casino Hold’em and Live three card poker. The last sub-category is the NetEnt Live Casino. Once you’ve clicked on of the sub-categories, the related lobby will be opened where you can choose between dozens of live tables. New players will receive a warm welcome at Dunder Casino. As you know – a great casino wouldn’t be complete without a great welcome offer. The welcome package consists of a bonus up to €600 + 200 free spins, which are all divided over four deposits. Your first deposit will be doubled up to an amount of €50. After the payment is complete, you’ll also receive 200 Free Spins which are divided over 10 days. You’ll be able to play 20 spins a day on the famous slot Starburst. After your second deposit you’ll receive a 50% bonus up to €100. After your third deposit you’ll receive a 25% bonus up to €150. Last but not least, on your fourth deposit you’ll receive another 25% bonus, this time up €300. Depending on your location, Dunder offers a total of 7 well-known and secure payment methods. First and foremost, it’s obviously possibly to pay with your VISA or MasterCard. Should you want to pay via an e-wallet you can opt for Skrill, Neteller or EcoPayz. It’s also possible to deposit money directly from your bank account via Trustly or Euteller. Players who prefer a more anonymous payment method can do so via Paysafecard. Although the minimum deposit is the same for every payment method (€20), the maximum amount can vary. Most can go up to €5000, with the exception of Euteller and Paysafecard. The limit for a Euteller payment is €1000 per deposit, and €200 for deposits via Paysafecard. The withdrawal limits are the as the deposit limits. Most of these will be processed instantly, although it can take up to 3 banking days to receive withdrawals if they’re requested via VISA or Trustly. After reading our review it should come as no surprise that we’ve really enjoyed playing at Dunder. The site is innovative and very user friendly at the same time. It’s clear to see that the creators enjoy gambling themselves, as they’ve implemented many features that help boost the gaming experience. We definitely recommend everyone to sign up at Dunder and give them a go.